The Belkin AC 1200 DB Wi-Fi Dual-Band AC+ Gigabit Router offers a new level of reliability, speed and coverage for all your Wi-Fi devices. Now the whole family can watch shows and play games online with tablets, smartphones, or Smart TV – all at the same time. AC is next-generation Wi-Fi, providing greatly improved coverage and speeds up to 2.8x faster than traditional N routers*. AC Wi-Fi signals travel faster and farther than the current standard and with Belkin's Simple Start installation is easy and quick - just use a smartphone, tablet or computer to set up your router. 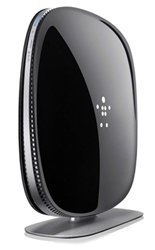 The Belkin AC 1200 also enhances mobile device performance, and works seamlessly with Wi-Fi ‘N’ and ‘G’ devices. Get the most out of all your wireless devices and take home networking to the next level with the Belkin AC 1200 DB Wi-Fi Dual-Band AC+ Gigabit Router. Get the fastest dual-band speeds for video streaming and gaming—up to 300Mbps (2.4GHz) + 867Mbps (5GHz)† for delivering maximum speed to multiple devices. Connect multiple wired devices at gigabit speeds. Up to 2.8x faster physical data rate when compared to 802.11n Wi-Fi routers using two antennas to transmit and receive data. Actual speeds will vary depending on a number of factors. In order to achieve the best performance, router must be used with a compatible wireless device. The standard transmission rates—300Mbps or 867Mbps (for 5GHz), 300Mbps (for 2.4GHz), 54Mbps, and 11Mbps—are the physical data rates. Actual data throughput will be lower and may depend on the mix of wireless products used.